I led a discussion at the Ottawa Agile and Scrum groups last week. I asked the group to come up with some reasons to do Release Planning. In essence, they represent the meta 'purposes' of release planning. Purposes that one's approach to Release Planning should try to optimize. The group came up with many good ideas, almost all of which I agreed with (if my opinion is useful). 1. Team building. A set of work or exercises that allows the newly formed Scrum team to start to think of themselves as a team, do some Forming, Storming, Norming, and otherwise start to become a team. 2. Realize where they disagree. Often we think people agree what the work or product is all about. We have no means (or only a poor means) to identify where we disagree. If release planning could only identify (better) where we disagree, then we all could learn from that. 3. Start to get the whole team on the same page. For example, it might be useful for the whole team to have, at a working level, a solid consensus on the effort or product on multiple levels. Such as: the vision, a good-sized feature list, where the business value is highest, what will cost the most to build, etc. To the degree one thinks these purposes of Release Planning are important, I think we might do Release Planning differently. I think #3 is very important. This is my phrase. Ken Schwaber talks about Flaccid Scrum. (Not my favorite metaphor.) Jeff Sutherland talks about ScrumButt and the Nokia Test. (I like this.) Uncle Bob Martin talks about "the land that Scrum forgot." People are doing Scrum in an unprofessional way, and then are not as happy with Scrum as I would like, nor than they deserve to be. And often want to blame Scrum. To me, this is not right in any way. The most important thing: we want people to have better lives, and it ain't happening enough just yet. Not for me. So, allowing technical debt to grow is one key symptom of what I often call 'unprofessional' Scrum. Here is Ward Cunningham's definition (and some other thoughts too). We business folks have to listen to the team, and learn how to understand technical debt. And allow them to build quality. As that book said a while ago, in essence, quality is free. This is a difficult subject. It is hard to understand, and some technical people give us too much BS. But none of those excuses or problems give us a get out of jail free card on this important area of managing new product innovation. We gotta do it. Professionally. Now, ok, I have to back peddle just a bit. I agree that occasionally, close to rarely, there are situations where we should not 'do it right' and for the immediate release, we should just 'get it out the door'. And THEN immediately go back and fix the technical debt. And I agree that Technical Debt is ultimately a business problem. The business people must ultimately decide when and how much to fix. But, they need the geeks to explain the details of the problem to them (typically they don't understand at all or very little). 1. The bad news does not get better with age. In other words, allowing technical debt to grow is not only unprofessional, and lying, but it is just plain stupid. About 98% of the time (ie, so often that it is not worth asking 'isn't this an exception case?'). 2. Scrum did not make you go fast. Ok, ok, yes they are called sprints. It sounds like we are in a rush. But pretending like the 100 yard dash is really the 90 yard dash is just unprofessional. If the story is not done, done with a strong definition of done, then you're just lying about your velocity. Three more fairly obvious things to say. 1. This is a hard problem. It is almost impossible to keep technical debt from creeping up. You will have to fight hard to keep things better. 2. It is worth the fight. You can make your life, the lives of your teammates, the lives of your customers, better. It a fight, a struggle, but actually fun to do as a team; and you will feel better for it. 3. Tools. Yes, there are lots of tools, techniques, specific approaches, and patterns to follow to stop increasing technical debt and to reduce the technical debt. But it starts with the human beings, the folks you work with, having the will to say: "We're fixing the problem with technical debt! We have to!" It is July 4th today. It is a great day to remember Freedom. As I have said elsewhere, to my way of looking at the world, there is one word, love, that is greater than freedom. But perhaps only that one. I was born in Virginia, and proud of it. One of the reasons is that Virginia is the birthplace of Thomas Jefferson, principal author of the Declaration of Independence, a great document for freedom. 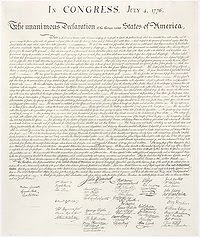 There are many great documents for freedom, but perhaps this is the greatest. Jefferson was, rightly in our view, ashamed of having held the political office of President, and refused to have that office mentioned on his gravestone. That office is about power, among other things. But he was rightly proud of being author of these and the other words in the Declaration. It is perhaps not clear enough, but Scrum too is about freedom. It may seem odd to some managers to say that they are taking away the freedom of the workers, but it is generally the fact I find. So, Scrum is trying to establish a degree of freedom, and with it a corresponding degree of responsibility (always the twin of freedom). It is perhaps true that some people are not worthy of that respect. But we find people in the Scrum teams almost all are worthy of that respect. And yet Freedom is fun. May the blessings of freedom become richer and deeper. So, especially today, to Freedom!